Jeff Bridges is currently starring this year in “The Mirror has Two Faces.” His Sun is in Sagittarius, his Ascendant is Virgo and his Moon is in Gemini. This is a man of great flexibility and variety. He can be athletic, optimistic, hard working, detail oriented, humorous and bright. 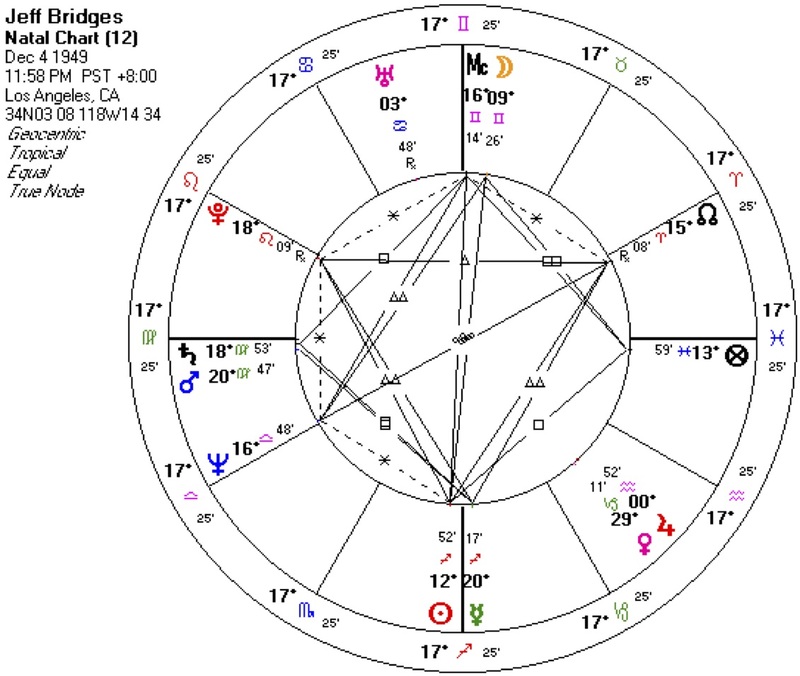 With Virgo rising and Saturn and Mars nearby, he can be depended upon, reliable, and responsible. But all that strength and steadiness can weight him down into emotional depression, overwork and worry if he takes life too seriously. He is likely to have had a childhood were he really wanted to please his elders, start his career and adult life early, and want respectability and recognition from others. His chart does not strongly point to being an actor but two factors did lead him there. Neptune and the Lunar Node are on his second cusp. This indicates that he will make his money in movies, oil, aviation or sailing. Neptune rules the areas of business that are associated with illusion, imagination and things that can never be totally known like the vastness of water, air and the esoteric. The other indicators is that his Mercury of work and service is on the 4th cusp that could lead him to follow in the family business after his father, Lloyd Bridges. Jeff could just as easily be behind the camera as a director or producer. He doesn’t have the strong Leo need to be in the spotlight. He would have made a good attorney since he has a strong sense of social responsibility, a need to teach and be heard, and a respect for history and the law. 1996 and 1997 will be fortunate for him will many opportunities for expansion and change in the illusion industry of Hollywood. He may have suffered from misrepresentation of others around him and trusting his associates too much in the past three years. The next five should be career advancing for him in the industry if he says yes this year to the opportunities offered to him or the ones he creates himself.